Imagine waking up to the sunrise outside your window. A warm, glowing orb of radiant light drives off the last shades of dusk and carries in the fresh spirit of the morning. Imagine putting it in a cup and drinking it to flush out the excesses of last night. Just like waking up to the earliest part of the morning, there’s an invigorating zest to be found in starting the day with a cup of warm water mixed with half a lemon’s juice. Like the first rays of the sun warming the earth for a new season of growth, lemon is an overall body cleanse that rejuvenates even your spirit and sets you on the way to a healthier start. 1. Vitamin C boosts your immune system. Take a step outside of your house and you’ll be instantly exposed to a wide array of exhaust fumes, cigarette smoke and airborne viruses. The modern environment calls for a stronger immune system. As a citrus fruit, lemon juice contains large amounts of Vitamin C which protect you from cough and colds while strengthening your immune system. It also acts as a natural antihistamine by reducing the risk of allergies. Its healing nature regenerates wounds, cuts, burns, and even broken bones. Vitamin C also helps diabetics regulate sugar levels. On a physiological level, your body and mind depletes its supply of vitamin C whenever you are stressed. Lemon juice can replenish it. 2. A stable pH level for your body. Your body acts like a river with continuous, self-replenishing streams. A polluted river cannot fulfill its natural functions and is a host to bacteria and toxic waste. A body that is high in acid content is a host to toxins that can cause various diseases. A polluted bloodstream does not help in processing oxygen. As a natural detoxifier, lemon juice helps to keep the pH levels in your body stable. A higher acid content in your body creates toxins that are hard to expel, as seen in people who eat lots of meat and saturated fats. A slow metabolism decreases speed in processing fats, and the body also becomes less resistant to viruses. With the detoxifying benefits of lemon, the bloodstream is cleansed and retains its important role in carrying oxygen and nutrients to all the areas of the body. 3. A weight loss and diet essential. If you want to stay fit and slim, consider how your body stores fats and if there are impedances to how efficiently food is processed in your body. The citric acid in lemon juice interacts with digestive enzymes and helps the digestive tract break down food. It also lowers the absorption rates of sugars from the food you eat. Lemon juice also aids in the absorption of calcium into the body. Once the digestive tract is lined with citric acid it absorbs calcium, which helps to burn the fat stored in cells. The fruit also has relatively low calories. Without the right amount of digestive juices, digestive problems occur. Upset stomach, nausea, bloating, belching and heartburn are common symptoms of indigestion. Lemon juice increases your appetite and kills bad bacteria present in the stomach to ensure proper digestion. Indigestion is also caused by poor bowel movement, as toxins and undigested matter remain in the large intestine. Lemon juice aids in eliminating waste more efficiently, and can relieve and rehydrate the tract to ease constipation. 5. Acts as a diuretic. Lemon juice stimulates the production of urine and toxins are flushed out of the urinary tract at a faster rate, helping to purify the system and keep it healthy. Lemon juice can alter the pH level of the urinary tract and inhibit the proliferation of bad bacteria. 6. Acts as a natural antiseptic. If you need a drink that helps clear blemishes and mild acne, look no further for that youthful glow. With its natural antiseptic qualities, lemon juice can cure problems related to your skin. It enhances your beauty and rejuvenates skin from within by removing toxins at a cellular level. It acts as an anti-aging remedy and can remove wrinkles and blackheads. 7. Hydrates the lymph system. The lymph system is the network of lymph vessels and nodes, thymus gland, spleen and tonsils. As a secondary circulatory system, it assists the body to collect tissue fluid not needed by the skin or capillaries then returns it to the heart for circulation. It expels toxins from the liver before these are absorbed into the body. Lemon water stimulates the lymphatic system to remove the toxins accumulated in the lymph glands, colon, and bladder overnight. A fresh start has never been so simple and convenient yet so refreshing and spirited. 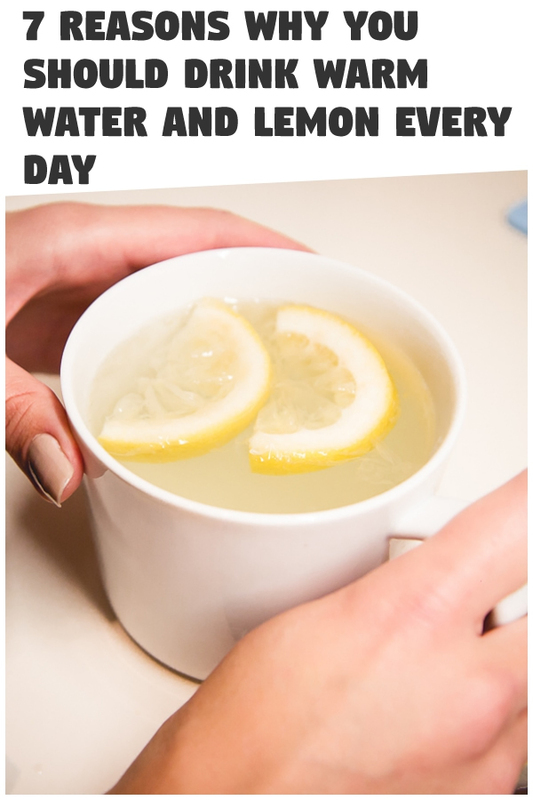 Greet the morning by waking up to brand new and healthier days with a zesty cup of warm water and lemon juice!